The YAMAHA FS1-E Owners Club is a UK based owners club for all models of the FS1-E and FS1 Sports Mopeds. Set up in November 2009 the Club already has a solid core of over 600 members backed by an enthusiastic team of staff dedicated to helping the members get the best out of their Fizzys. The Club is based around the online Forum/Message Board which is full of advice and information and although primarily a UK Club, there are members from countries around the world. It's a Club that is growing on a daily basis and one that extends well beyond ownership of the vehicle itself, as it creates a community feel and treats every member as if they were family. The purpose of The YAMAHA FS1-E Owners Club is to promote, organise and conduct within the club and other Classic Motorcycle Clubs, events such as Shows & Exhibitions Rallies, Tours, Charity Events, social functions and other similar events. 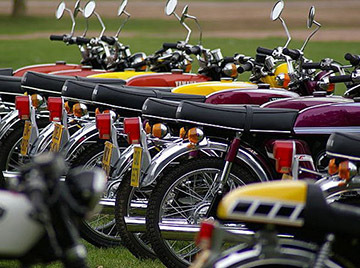 It has also been set up to assist members of the club in the maintenance, restoration and enhancement of members' vehicles and to ensure as many of the surviving iconic mopeds are put back on the road and not on the scrap heap. We shall also endeavour to obtain and maintain historical, statistical and other records and documents pertaining to the Club vehicles which will then constitute the OFFICIAL YAMAHA FS1-E UK REGISTER. The Club is also registered as a DVLA “Approved Vehicle Owners Club” to be able to provide owners of all models of FS1-E's and FS1's with Dating Certificates to accompany Age Related Number Plate Applications where the original V5C logbook and Registration Number have been lost over the years, plus other Marque specific registration issues. The YAMAHA FS1-E Owners Club, which includes the online Forum, is also designed for the fellow member in mind with the focus being primarily on two areas; Technical help and discussion and to organise and provide information on both local and national events, meets and ride-outs. After all - getting out there on your Fizzy is as important as restoring, fixing, tuning, and modifying and polishing & cleaning your pride and joy. Professionally run Club, by enthusiasts for you the enthusiast. Your chance to meet like minded 'Fizzy' owners sharing a common hobby and to relive your youth. Help, Parts Sourcing, Buy & Sell, Owners Own Restorations Picture Diaries, plus much, much more! “Find your Old Fizzy Service” - The Club holds all the data of the UK FS1-E Register which is being added to weekly with new members joining. Can you find your old fizzy and join some of the members who already have found their old love!? Benefit from very competitive Club Members Discounts and “Club Agreed Bike Valuations” from our market leading specialist Classic Bike Insurance partners, Footman James. Static Club Stands at various UK Classic Bike Shows and Events organised and attended. Your chance to show off your pride and joy. 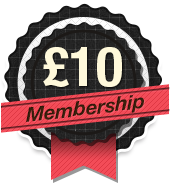 The Annual Membership fee still costs just £10, which is fantastic value for money and compares very favourably to most other similar Classic Bike Owners Clubs. Most members very quickly get their tenner back in savings on things like their Classic Bike Insurance policy with our Insurance Partners Footman James, special discounts on part, accessories and Club merchandise, free tickets and invites to shows and events.